Dynamics 365 is moving so fast – how can you keep up with what’s new while doing your job? Well, to help you, we’ve just launched the 365 Talent Portal YouTube channel. 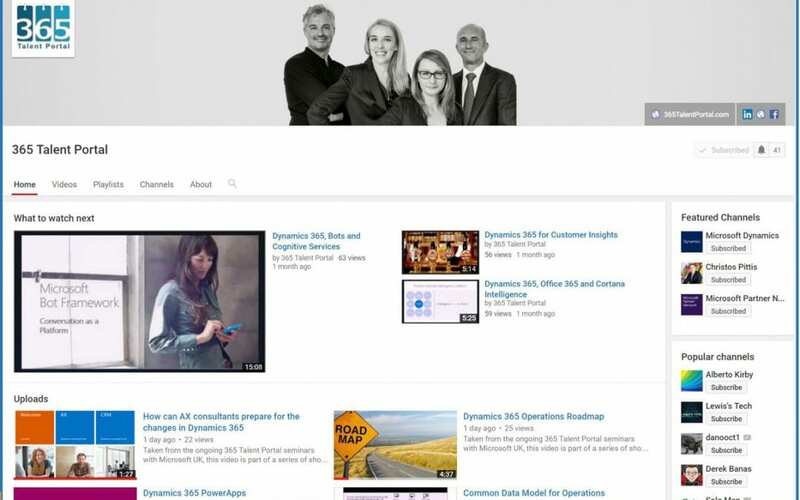 This is a collection of YouTube bite-sized Dynamics 365 clips focussed on specific features or aspects of Dynamics 365, Azure, Power BI, and related apps. So you can now get up to speed in bite-sized, digestible chunks. Better still, you can subscribe to the channel, and then it will let you know automatically each time we add new content. Content already published covers Dynamics Operations, Sales, Marketing, Service, PowerApps, Flow, Bots Framework, Hybrid Model, Customer Insights, Cortana Intelligence, as well as links to excellent Dynamics and Azure information sources.